With Mr. Noble's permission, I'm excerpting the article below, and adding illustrations and comments from my own musical life. CN: When it comes to most things in life, there isn’t much of an advantage of being older except for one thing: experience. When you live longer, you have more experiences, both good and bad. When I was in high school, and even college, there were many things that I know now that I wish I’d known back then. Here’s my top ten list of things that I wish I’d known when I was a young musician. 1. Quality Practicing is far better than mindless practicing. CN:Practicing isn’t a matter of how many hours you put in, but how many good hours you put in. It’s quality, not quantity. Practicing intelligently is something that my best teachers instilled in me, and it’s vital if you’re going to survive in the professional world. You don’t always have months to prepare your repertoire, and after school is over other demands will fill in the open spaces, and being able to be efficient in your practicing will pay for itself many times over. Trust me on this one. Jen adds: I remember Trevor Wye commenting on the net that one of the reasons he wrote his TONE book was because as a student himself on a night before a flute masterclass he heard a fellow student playing longtones on the hotel balcony that were blasty, airy and dispairy. 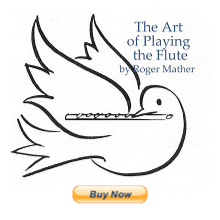 ;>) Could it be possible that a flutist would do longtones every day that actually taught them to play with the WORST possible tone? Hopefully we all have heard the phrase "It's better to play a single note with beautiful tone and musical direction than to cover pages of exercises with poor tone and dubious fingers", and it is true. The longer you play music, the more true it becomes. After 30 or more years practicing, you'll know for sure that it's true. So trust us all on this one. Practice only the most beautiful notes in the world. Make every second count; make every moment full quality. 2. Balanced posture and instrument holding are very important to your development as a musician. CN: Your body is also your instrument - learn how it works and take care of it. I cannot stress this enough. Every year I see high school aged musicians who are suffering from overuse injuries (see #1 above) that might have been avoided with some basic knowledge of how the mechanics of playing their instrument affect their physical well-being. A book of stretches is essential: daily stretching before practice and rehearsals can absolutely save your future career. I recommend the classic book Stretching by Bob Anderson. There are also such disciplines as the Feldenkrais Method or Alexander Technique that can help you become aware of your body and its motions that can be extremely helpful both before and after an injury happens. Jen adds: I've had some very intelligent teenage students who don't really believe that injury can happen to them (especially those that play both piano and flute). Finally I came up with an explanation that seemed to get through to them. I said: "Teachers don't just make up posture and instrument holding advice to be rigourous and drill-sargent-like, you know. :>) The advice comes because we have hurt ourselves, and we want you to avoid the injuries that wasted years for us!" 3. Slag not, yest ye be slagged. CN: Being professional is a 24 hour job. When I was in school, we used to have a phrase that described this: The Conservatory Curse. If you were talking trash about someone else’s performance, chances are they were standing right behind you - no matter where you were. What to do? Don’t talk trash about or to other musicians. You never know when or where you’ll run into them again - they might be in a position to help your career later on when you least expect it, and chances are they won’t be in a charitable mood if you’ve been rude to them. I had a teacher who was at the very pinnacle of his profession who I never, ever heard utter an unkind word about anyone, either personally or professionally. It’s a standard that I strive to attain myself, and the old saw that one catches more flies with honey than vinegar is absolutely true. Jen adds: I had a flambuoyant theory professor once who used to get pretty excited about the lastest opera, cast, costumes, voices and interps. He'd colourfully act out the singers, and discredit the costumers for allowing molting ostrick feather boas on opening night, and quite enjoyed himself on the topic. One day, on the way to his class, walking up to the music school, I did what I thought was a perfect imitation of him, with fellow students laughing along. I said: "And GUESS what she was WEARING??!!" and suddenly a voice came from beside me all breathless: "WHAT was she wearing? "...and, you guessed it, it was the theory professor. And I might add he didn't even know who I was talking about, because I'd only been imitating his voice on a randomly chosen sentence. I said: "Oh sorry, I was doing an imitation of YOU!" We laughed it off, but the person who you're slagging may in fact be standing behind you, or may be in your future, so hold onto your mirth and your condemnation when with colleagues...yes indeed. Also avoid the constant slagger who does so from a competitive and disrespecting place; they'll slag others in front of you, and then turn around and slag you in front of others. With a constant musician slagger no one is safe, including them. Be happy; be giving; be generous; keep slagging power plays from prolificating. More to come in next post Part 2. And huge thanks to Charles Noble for his permission to reprint here. Well done!